The S2N2E Gateway is a Communication Bridge between a local Johnson Controls’ Metasys N2 Communication Bus (N2 Bus) and multiple remotely connected N2 Buses and N2 Compatible field devices. These multiple N2 Buses/Devices can be located across the city, country, or even the World providing that they have access to a TCP/IP Ethernet connection (i.e. Corporate Intranet, Internet, etc). The S2N2E bridges the Ethernet connection transparently to both the NCM/NAE and the remote N2 devices. 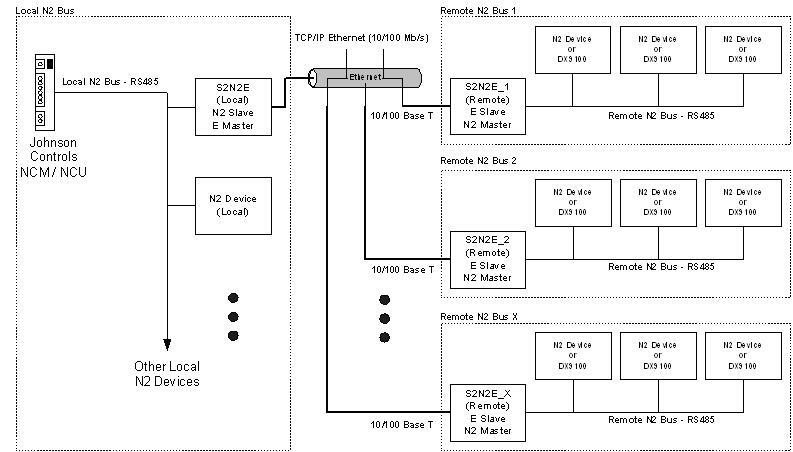 Two S2N2E devices are required (minimum configuration) where one device (local) acts as a N2 slave/Ethernet Master and the other (remote) an Ethernet Slave/N2 Master. The total link is transparent to the Metasys Operating Software, the local NCM/NAE, and the remotely connected N2 devices. Thus, remote N2 devices can be monitored and controlled by Metasys/NCM as if they were locally connected.